I've no particular comment for the time being. It is nearly 500 pages long, with about 4,000 footnotes. There is a lot on the doctrine of 'joint criminal enterprise', which continues to fascinate, although it appears to be on its last legs. The International Criminal Court has dropped the joint criminal enterprise approach to liability. As most readers of this blog know, Richard Goldstone chaired the fact finding commission that recently issued its report on war crimes committed in the Gaza conflict during December 2008 and January 2009. There is a very fine interview with Richard Goldstone by Bill Moyers on Public Broadcasting in the United States: http://video.iptv.org/video/1305873886/. Judge Goldstone cut his teeth as a white South African helping to bring down the apartheid regime. Now, as a Jew and a friend of Israel he has condemned war crimes for which Israeli troops were responsible. The world should be thankful that we have people like Richard Goldstone. He had better be on next year's Nobel short list. (iii) the interests of the accused are represented by counsel. (ii) the accused, having made his initial appearance, is at large and refuses to appear in court. the ends of justice without justification. Rule 82 bis of the Rules of Procedure and Evidence of the International Criminal Tribunal for Rwanda was adopted in the context of the refusal of an accused, Jean-Bosco Barayagwiza, to attend his trial. At the beginning of the trial, in October 2000, his counsel told the Trial Chamber of the International Criminal Tribunal for Rwanda that their client would not be attending the trial, and that he had instructed them not to represent him, all of this ‘based on his inability to have a fair trial due to the previous decisions of the Tribunal in relation to his release’. Barayagwiza personally issued a statement ‘refusing to associate himself with a show trial’ and insisting that ‘the ICTR was manipulated by the current Rwandan government and the judges and the prosecutors were the hostage[s] of Kigali’. The Trial Chamber declared that ‘Barayagwiza was entitled to be present during his trial and had chosen not to do so, and the trial would proceed nonetheless. The Chamber also stated that he would be free to attend whenever he changed his mind.’ Counsel were ordered to continue representing Barayagwiza. They attended at court until February 2001, and then informed the Trial Chamber that their mandate had been terminated. A new counsel, Giacomo Barletta-Calderera, was soon appointed for Barayagwiza, and he represented Barayagwiza for the duration of the trial, but Barayagwiza never attended personally. Barayagwiza’s appeal on grounds that he had not been present at trial was therefore dismissed, given that he had voluntarily waived his right. Simić sentencing judgement , supra note 110, para. 8. The provision, adopted 1 August 2003, contains slight but insubstantial changes from the original version adopted on 7 March 2003. Ruling on the Issue of the Refusal of the Third Accused, Augustine Gbao, to Attend Hearing of the Special Court for Sierra Leone on 7 July 2004 and Succeeding Days, Prosecutor v. Gbao, Case No. SCSL-2004-15-T, T. Ch., SCSL, 12 July 2004, para. 8. See also Ruling on the Issue of Non-Appearance of the First Accused Samuel Hinga Norman, the Second Accused Moinina Fofana, and the Third Accused, Allieu Kondewa at the Trial Proceedings, Prosecutor v. Norman et al., Case No. SCSL-04-14-PT, T. Ch., SCSL, 1 October 2004; Ruling on the Issue of the Refusal of the Accused Sesay and Kallon to Appear for their Trial, Prosecutor v. Sesay et al., Case No. SCSL-04-15-T, T. Ch., SCSL, 19 January 2005. M. Momeni, ‘Why Barayagwiza is Boycotting his Trial at the ICTR: Lessons in Balancing Due Process Rights and Politics’, (2001) 7 ILSA Journal of International and Comparative Law 315, at 315-316. Decision on Defence Counsel Motion to Withdraw, Prosecutor v. Barayagwiza, Case No. ICTR-97-15-T, T. Ch. I, ICTR, 2 November 2000. Similarly, Gbao – Decision on Application to Withdraw Counsel, Prosecutor v. Gbao, Case No. SCSL-04-15-T, T. Ch., SCSL, 6 July 2004. Judgment and Sentence, Prosecutor v. Nahimana et al., Case No. ICTR-99-52-T, T. Ch. I, ICTR, 3 December 2003, para. 83. Judgment, Nahimana et al. v. Prosecutor, Case No. ICTR-99-52-A, A. Ch., ICTR, 28 November 2007 (‘Nahimana et al. appeal judgement’), para. 89, footnote 186. The option of forced appearance was briefly considered by another Trial Chamber but opposed by defence counsel: Transcript, Prosecutor v. Rwamakuba, Case No. ICTR-98-44-C-I, T. Ch. III, ICTR, 6 June 2005, at 3. Nahimana et al. appeal judgement, supra note 118, para. 98. Ibid., citing Decision on Prosecutor’s Motion for the Admission of Certain Materials under Rule 89(C) of the Rules of Procedure and Evidence, Prosecutor v. Bagosora et al., Case No. ICTR-98-41-T, T. Ch. I, ICTR, 14 October 2004, paras. 18 and 19. Ibid., citing Decision on Vidoje Blagojević’s Oral Request, Prosecutor v. Blagojević and Jokić, Case No. IT-02-60-T, T. Ch. I (Section A), ICTY, 30 July 2004, at 8; Decision on Motion for Exclusion of Statement of Accused, Prosecutor v. Halilović, Case No. IT-01-48-T, T. Ch. I (Section A), ICTY, 8 July 2005, paras. 22 and 23. Read Michael Lerner in The Guardian on the Goldstone report: http://www.guardian.co.uk/commentisfree/2009/oct/21/war-crimes-white-wash.
A citizens campaign has been started to propose former President and UN High Commissioner for Human Rights, Mary Robinson, for the new post as President of the European Union. The choice will be made by the EU Council, i.e. the representatives of the member states. The selection of Mary Robinson would send a signal that the European Union is concerned about social exclusion, racism and the protection of human rights and the new President would hopefully be able to exert some influence on European Union policies both within Europe and in the wider world. The candidate most mentioned at the moment is Tony Blair, who would not send out those signals. The European Union leaders meet on 29 October and while the appointment will not be decided on then, the discussion abut the post will begin in earnest. If there was a strong grassroots groundswell in favour of Mary Robinson, it might influence them. There is a petition to sign at www.maryrobinson.eu/petition.html and the campaign has a website at http://www.maryrobinson.eu/ where you can also sign up and add to the list of supporters on Facebook. Popović has been tried by the International Criminal Tribunal for the former Yugoslavia, and a judgment of the Trial Chamber is expected later this year. Thanks to Fidelma Donlon and Melissa Ruggiero. The Grotius Centre for International Legal Studies (Leiden Law School & Campus Den Haag) has two PhD vacancies for the project ‘Post-Conflict Justice and Local Ownership’ funded by the Netherlands Organisation for Scientific Research (NWO). The project will involve research and testing of the design and management of international criminal justice. It examines rationales and methodologies of external intervention in justice responses, the societal impact of international criminal proceedings, based on analysis of the first practice of the International Criminal Court (ICC), and the contribution of the ICC to capacity-building and legal harmonisation in conflict and post-conflict situations. Fo more information: http://www.grotiuscentre.org/com/doc.asp?DocID=44 or write to Dr. Carsten Stahn (cstahn@campusdenhaag.nl) or Dr. Larissa van den Herik (L.van.den.Herik@LAW.leidenuniv.nl). Can Palestine Join the International Criminal Court? There is a report that Palestine is preparing to become a ‘member’ of the International Criminal Court: http://www.maannews.net/eng/ViewDetails.aspx?ID=232793. The report says that information has been requested from the Court with a view to carrying this out. According to article 125 of the Rome Statute, ‘This Statute shall be open to accession by all States. Instruments of accession shall be deposited with the Secretary-General of the United Nations.’ Thus, Palestine can join to the extent that it is a ‘State’. Indeed, an attempt to accede to the Rome Statute could be interpreted as a manifestation of statehood. But the Palestinian Authority is knocking on the wrong door. It is not the Court that decides who may join; this is the job of the depository, which is the Secretary-General of the United Nations. I would be very surprised if the depository were to accept an instrument of accession from Palestine. Of course, Palestine might then apply to the Assembly of States Parties which, I think, could probably override a decision by the depository. But isn’t the real problem that Palestine has not yet manifested its desire to be considered a State, or at least not recently? I am sure that if Palestine were to declare itself a State, it would be recognised by many other States very quickly. But it has to take this step first. I was in China on the weekend, attending the final seminar of the EU-China Project on capital punishment, and attending the launch of the International Research Centre on Death Penalty Reform, which will be hosted by the law school of the Beijing Normal University. The meeting was attended by many senior judges, government officials and academics. The photo shows my colleague Huang Fang, who is a professor at the Law Institute of the Chinese Academy of Social Sciences. She recently received a prestigious award for the publication of a translation of my book Introduction to the International Criminal Court. The seminar brought out all of the contradictions in the ongoing debate about the death penalty in China. On the one hand, there is more writing, publishing and research activity on the subject than ever before. Moreover, it is obvious that views continue to evolve, and that there has also been a substantial drop in the use of capital punishment in the last few years. At the same time, many Chinese experts cling stubbornly to the idea that there is great support among the people, and that the government cannot go ahead with reform until this changes. Our colleagues at Wuhan University, together with the Max Planck Institute in Fribourg, produced a detailed public opinion survey whose results were presented during the weekend meeting. These results were analysed by Professor Roger Hood, professor emeritus of criminology at Oxford, who explained that they should encourage moves towards abolition. According to Professor Hood, the results demonstrate that there is a majority in support of capital punishment only for the crime of murder, and that there are many other indications in the survey showing that the people of China are far less enthusiastic about capital punishment than their leaders claim. In fact, the survey shows that there is much greater support for the death penalty among the professionals in the system than among the ordinary population. Professor Hood says this is a case of those engaged in the system trying to justify what they do. The new International Research Centre in Beijing is headed by a dynamic senior scholar, Professor Zhang Bingzhi, and we hope it will continue to lead the debate within China. Professor Hood, Professor Hans-Jörg Albrecht of Max Planck, myself and others will be involved with the Centre in an advisory capacity. Iran has hanged a man for a crime committed when he was seventeen years of age: http://www.upi.com/Top_News/International/2009/10/13/Iran-hangs-man-sentenced-when-17/UPI-23491255453386/. This violates Iran's obligations under article 6(5) of the International Covenant on Civil and Political Rights, article 37(a) of the Convention on the Rights of the Child and under customary international law as codified in the Safeguards adopted by the Economic and Social Council in the early 1980s. Iran is probably the only country in the world to persist in such violations. The United States of America ceased executions for juvenile offences in 2005, following a ruling of the Supreme Court. The prohibition on executions for juvenile crimes has become a universal norm since it was first set out in the fourth Geneva Convention in 1949. It isn't the only problem Iran has with modern human rights standards, but it is certainly a flagrant one. Richard Sonnenfeldt, who played an important role in the Nuremberg trial, has passed away. Students of mine hwo have seen the film Nuremberg: The Nazis Faced with their Crimes, may remember the interview with him. 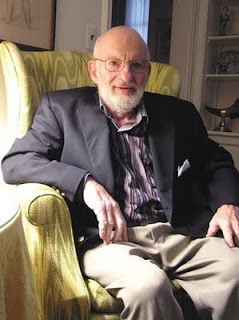 Richard Sonnenfeldt was born in Germany in 1923, a Jew and, at various points, a refugee from Nazism, a young student in England, an 'enemy alien' interned in the United Kingdom, a refugee in Australia and India, an immigrant to the United States, an engineering student, a U.S. citizen, an American soldier fighting in Italy and Germany, an Office of Strategic Services interpreter, the chief interpreter, a key interrogator and a very central player on the U.S. prosecution staff at Nuremberg. For his obituary in the New York Times: http://www.nytimes.com/2009/10/13/nyregion/13sonnenfeldt.html?scp=1&sq=richard%20sonnenfeldt&st=cse. His 2007 interview with Charlie Rose: http://www.charlierose.com/view/interview/8475. The 'Jackson List' post by John Q. Barrett: http://www.stjohns.edu/media/3/cf01f851490643c6b0e6e331a781462e.pdf. Also, 2003 and 2004 Jackson Center interviews with Richard (near bottom, under “Other Nuremberg Trial Participants”): http://www.roberthjackson.org/Center/videolist/. Thanks to John Q. Barrett. This past weekend, a group of lecturers and doctoral students from the Irish Centre for Human Rights met with our colleagues at the Centre for Civil and Human Rights of the University of Notre Dame, in South Bend, Indiana. It was the first of what we plan as an annual meeting of the two Centres. The purpose is to discuss and debate emerging issues and developments in human rights in a relatively unstructured and collegial manner. We are already planning next year's event, to take place in Galway on 16-18 October. Our hope is to enlarge the circle beyond our two institutions, and that academics, officials, journalists and activists who are interested in human rights will join us for these meetings. This year's exchange heard presentations on post-conflict justice in Rwanda, the Obama administration's record on counter-terrorism measures, the influence of the Universal Declaration of Human Rights, legal issues concerning the use of combat drones, the abolition of the death penalty and the record of the ad hoc international criminal tribunals. A bit eclectic, but that was always the general idea. Presenters include Doug Cassel, Mary-Ellen O'Connell, Steven Smith, Shane Darcy, Ximena Medellín, Meg de Guzman, Jimmy Gurule, Gerald Gahima, Brian Farrell, Sean O’Brien and myself. We were honoured by the attendance of Father Ted Hesburgh, founder of the Notre Dame Centre and former President of the University. 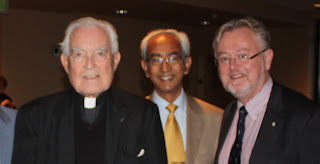 The photo shows Father Hesburgh with Dr Vinodh Jaichand, deputy director of the Irish Centre (middle) and myself. We're grateful to our hosts at Notre Dame for a fabulous weekend, and hope we can be as courteous when they visit us next year. Raphael Lemkin was the Polish-Jewish scholar who invented the term ‘genocide’. He devoted much of his life to campaigning for the adoption and the widespread ratification of the Genocide Convention. A collection of his papers has been digitized and is available on line: http://digital.cjh.org/R/?func=collections-result&collection_id=1634. A conference on Lemkin is being held in New York City on 15 November 2009: http://www.cjh.org/lemkin/. The National University of Ireland, Galway has jumped to 243rd position in the World University Rankings, which are issued annually by the Times Higher Education Supplement. According to last year’s ratings, Galway went from 484th place in 2007 to 358th place. So this year we leapt another 125 places. It places NUI Galway in the top 95th percentile of universities in the world. NUI Galway scored the biggest gain of all of the Irish Universities. We were also ranked 272nd in the top 300 in the Arts and Humanities Area. We’re not (yet) in the same league as Harvard and Oxford, but we’re an energetic and dynamic institution that prides itself on its centres of excellence, one of which is the Irish Centre for Human Rights. The Law Society is looking for a 'human rights executive' to work three days per week. The job is described as: 'C0ompleted or be undertaking a PhD in a field relevant to access to justice aqnd human rights...' See: http://www.mediafire.com/?dcy55bmm1u2.